Not only were we there to meet the whole team, but 2 days would be spent doing the Via Francigena walking tour! Never heard of it? You are not the only one. The Via Francigena is a pilgrim route to Rome from England. 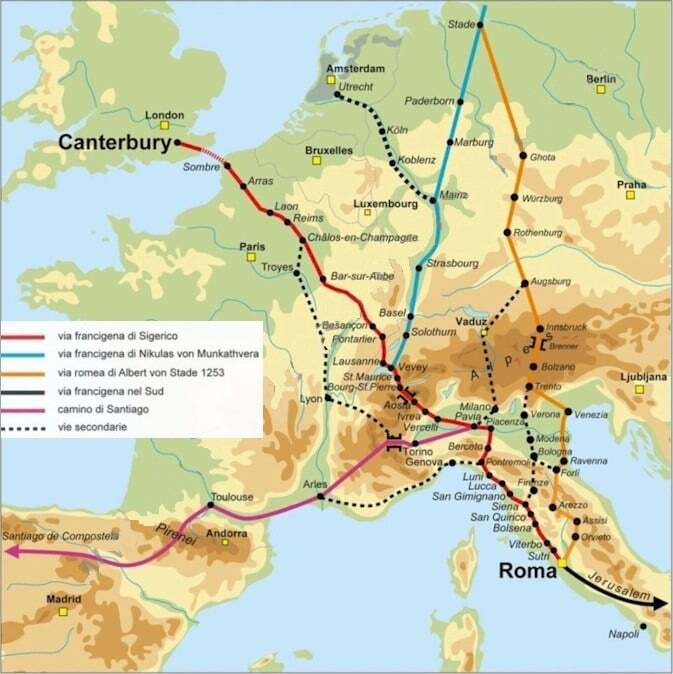 Over 2,083 km long and dating back to the Middle Ages, this ancient route connects Canterbury in the UK with Rome in Italy. At its highest point, it crosses the Saint Bernard’s Pass in Switzerland. 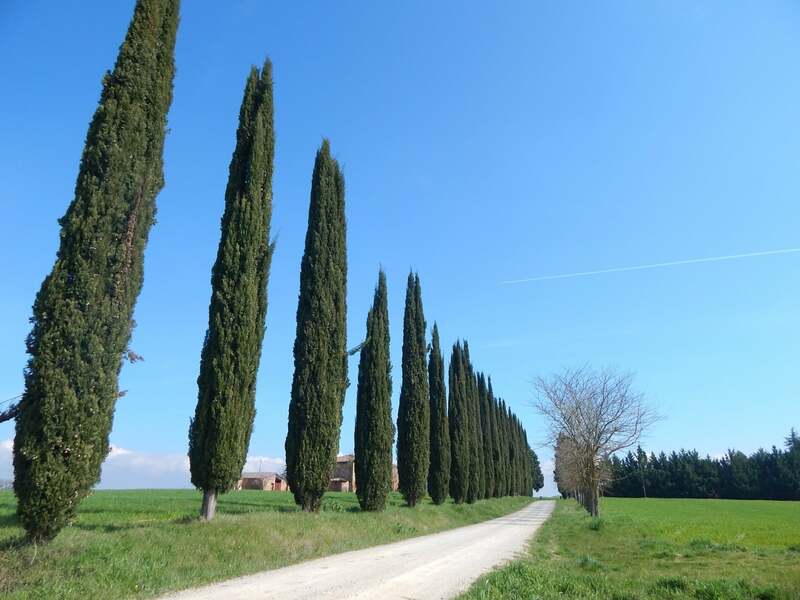 The Via Francigena is not a single road in the traditional Roman sense, but rather a series of roads which have changed over the centuries depending on the flow of people or trade. The road does not connect cities, but rather abbeys where those traditionally walking the route sought shelter and food. The Via Francigena used to be as popular as the Camino de Sanitago in Spain, but, unlike other things in Italy, the route became unfashionable. The route, however, survived. In 2009, the Italian Government decided to revive the Italian stretch of the Via Francigena to aid tourism and became a popular destination for those who are interested in walking in Italy. Dating back to 990 AD, there is a documented itinerary from Archbishop Sigeric of his return journey from Rome back to Canterbury. Modern day pilgrims wishing to follow in his footsteps would travel from Canterbury, through the county of Kent to the English Channel then traverse across France, through the areas of Nord-Pas-di-Calais, Picardy, Champagne-Ardenne and Franche-Comte before reaching the Swiss border. In Switzerland (the hardest part) the via Francigena passes through the cantons of Vaud and Valais before crossing the Saint Bernard’s Pass. Moving across into Italy, the walk continues through the regions of Valle d-Aosta, Piedmont, Lombardy, Emilia-Romagna, Tuscany and finally Lazio. That might not sound exciting, but when you think about the different landscapes you would see en-route, such as The White Cliffs of Dover, the Great War battlefields and memorials of Northern France, the Champagne region, Lake Geneva, over the mighty Alps, across the Appinnies, the rolling hills of Tuscany and lastly the eternal city of Rome, it all starts to sound quite appealing. We took the 21st century way of travelling by plane from Edinburgh to Pisa. 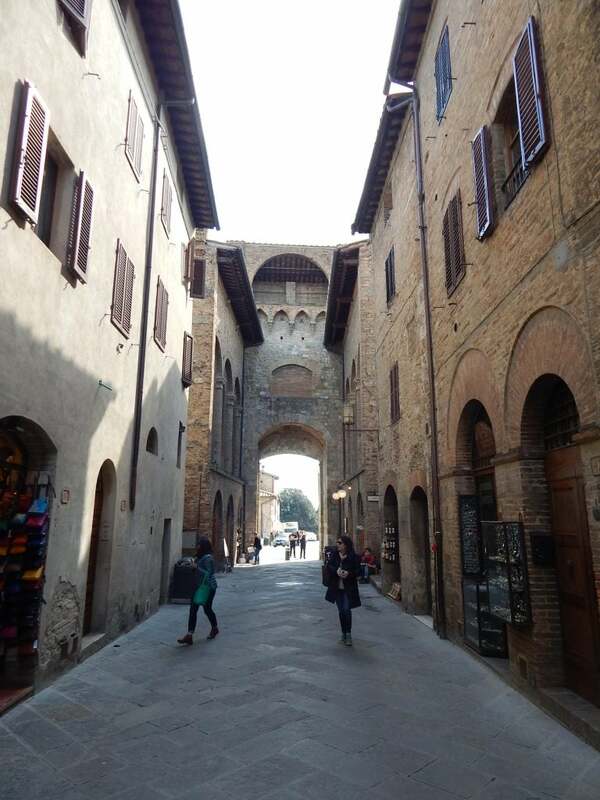 Our first stop in Tuscany was the beautiful Tuscan hilltop town of San Gimignano. Included in UNESCOs ‘world heritage centre’ list, walking through the narrow and ancient streets of this town you can understand why it made the cut. It was a Saturday afternoon when we arrived. After travelling from a dark and rainy Edinburgh, feeling the sun’s rays on your face was a welcome bonus! 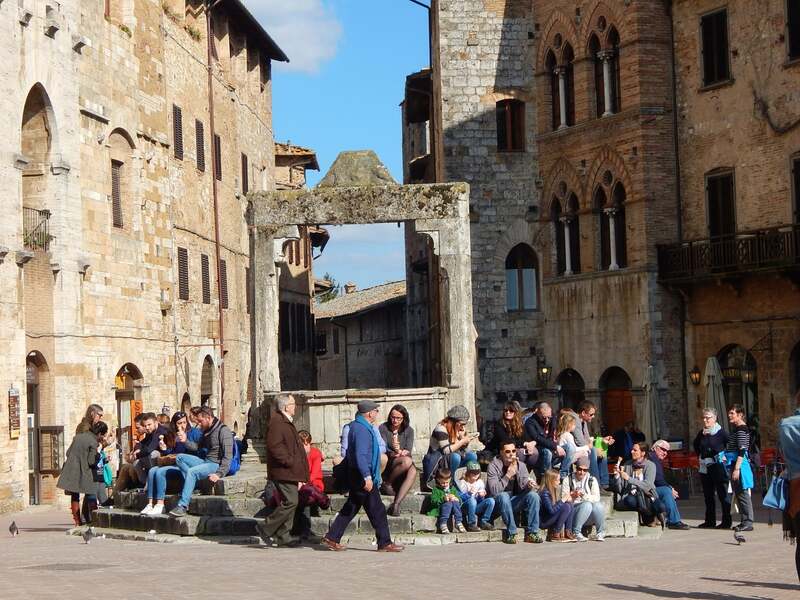 Walking around San Gimignano, moving from sunlight to shadows, we eventually reached the main piazza. Situated on the left-hand side of the square is something not to be missed! 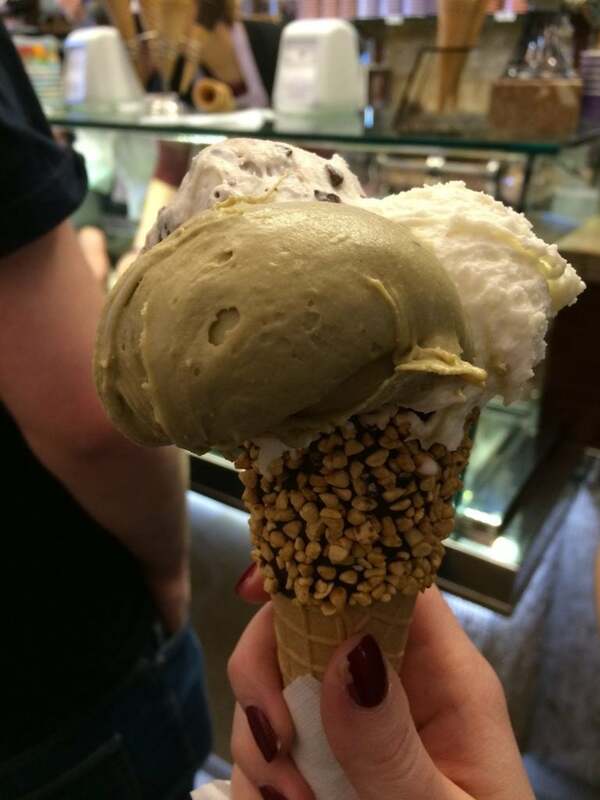 You can probably guess what it is … Gelato. This is no ordinary ice cream parlour. Gelateria Dondoli has been Gelato World Champion in 2006/2007 and 2008/2009. Quite impressive, but once you try their offering you will soon understand why they have won such accolades. Making a decision was tough, but I opted to try the Italian classic, stracciatella, with a scoop of pistachio and coconut. The gelato was, without a doubt, the best I had ever tasted! 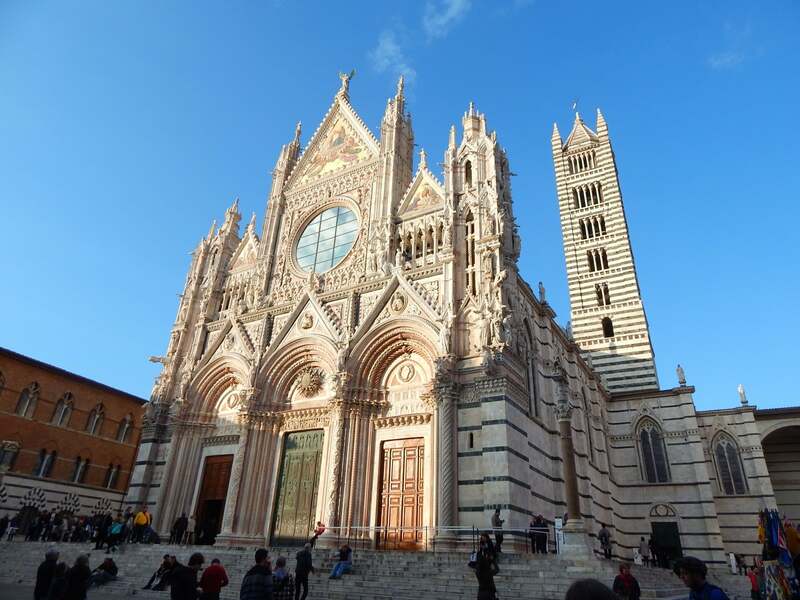 Siena should be a high priority on any trip to Tuscany. After arriving at our hotel we had some free time to walk around Siena. Siena never fails to lift the soul! Its medieval architecture and winding streets fill you with total awe. 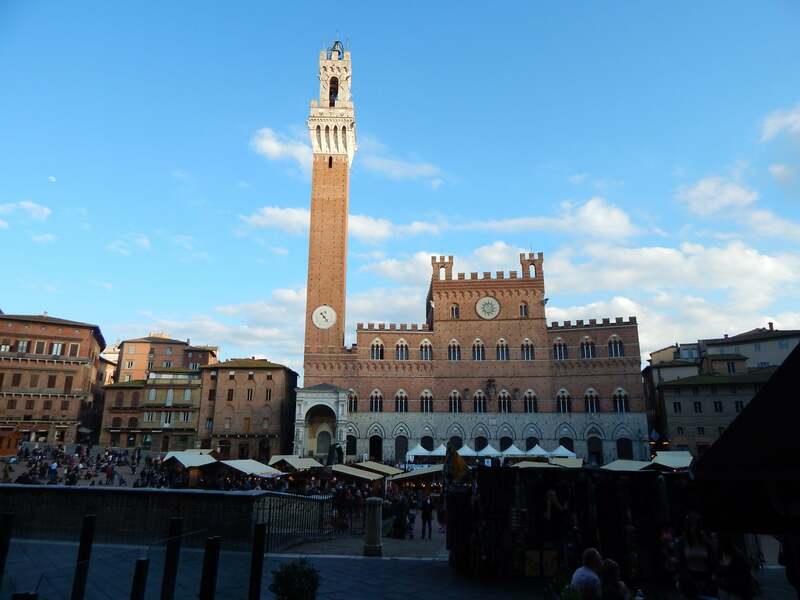 Make your way to the centre and you will find its crowning glory – Piazza del Campo. Its unique sloping, fan shape piazza dominates the centre of the city. Siena’s Duomo is almost a match to rival Florence’s, but Siena’s unique black and white marble horizontal stripes dominate this impressive cathedral. I think this is the first I have ever seen this magnificent building without scaffolding. The mystery of its true identity has finally been revealed. This was the night before the start of our walk on the Via Francigena, a hearty feast was needed to fuel bodies before our day of walking in the Tuscan countryside. The whole team got together at Trattoria La Torre, situated close to the Piazza del Campo in Siena. We started with amazing fresh pasta – spinach and truffle tortellini with cacio e pepe. I did not feel guilty enjoying this, as it would be walked off the next day. The second plate was roast pork and chicken with potatoes in a tomato sauce and salad. After a night of great conversation and getting to know new faces, it was time for bed. This is what would be greeting us in the morning. And in part 2, we have documented the rest of our walking pilgrimage. It’s full of ups and downs.